Hillary Clinton called out the Republican Party for backing down to President Donald Trump, asking "Why are they so intimidated?" Clinton spoke to "The Late Show" host Stephen Colbert in a wide-ranging interview Friday, tackling everything from special counsel Robert Mueller's investigation to the Brett Kavanaugh nomination and whether Trump should be impeached. "I do not understand what happened to the Republican Party," Clinton said. "I served with a lot of these people, why are they so intimidated? At some point you've gotta put country before party." Hillary Clinton appears on "The Late Show with Stephen Colbert" on Friday, Sept. 21, 2018. The former secretary of state and Trump's opponent in the 2016 presidential election -- Colbert reeled off her accomplishments, including "winner of the popular vote" -- stuck to her talking points early in the interview, which was pegged to the paperback release of her book, "What Happened." Clinton struck a nonpartisan tone, saying it was the country in general that is in a time of political upheaval, and not just Trump is to blame. "I want people to take it seriously, regardless of who you voted for," she said. "I want them to think about why our democracy is in chaos." Clinton also criticized Republicans over their treatment of Dr. Christine Blasey Ford's allegation of sexual assault against Supreme Court nominee Brett Kavanaugh. She called for an FBI investigation, as requested by Ford, before testifying to the Senate Judiciary Committee. She called it a "fair request" and said it "wouldn't take that long." She also also elicited a cheer from the audience when she said she had "no sympathy" for Republican senators dealing with the issue of when Ford will testify, if at all. "No, I have no sympathy," Clinton answered. "They've done everything they can to try to ignore it [Ford's allegations], to try to undermine it. ... We owe it to our constituents, to our Constitution, to do it right," she said. "They're the ones who turned it into a political football." 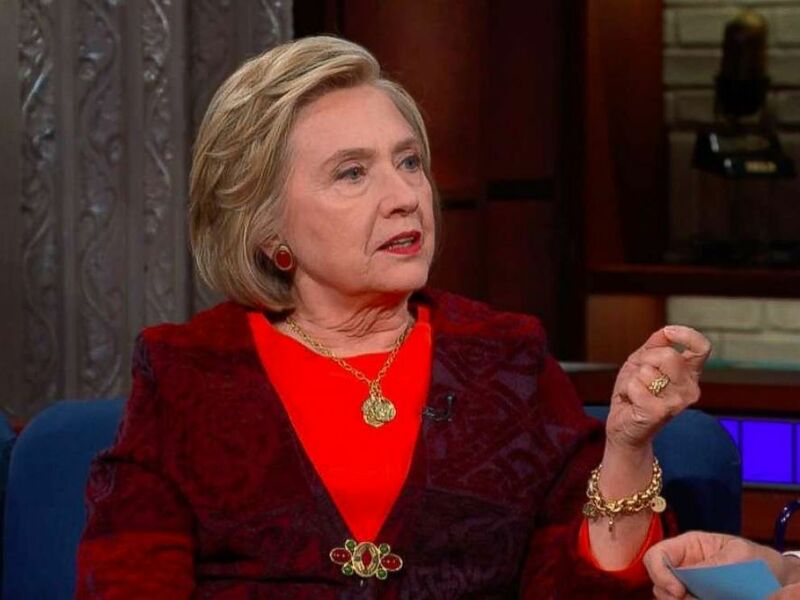 Clinton did deflect talk of impeaching Trump, saying, "There is a constitutional crisis that doesn't have to be looked at only through impeachment."